The all-electric Kia Soul unveiled. Kia Motors staked its claim for leadership in advanced powertrain technology at the 2019 Geneva International Motor Show with a display made up entirely of electrified vehicles. The annual car show marked the world debut for Kia’s new fully-electric Imagine by Kia concept, alongside the fully-electric Soul EV, which made its European debut at the show. Kia has also announced a range of upgrades to the Niro hybrid and plug-in yybrid, with the new variants revealed. Demonstrating the depth of its advanced powertrain line-up, every Kia vehicle on show in Geneva employed the brand’s mild-hybrid, hybrid, plug-in hybrid, or electric vehicle technology. Kia has also introduced its new ‘UVO Connect’ telematics technology in Geneva, available on the Soul EV and upgraded Niro hybrid and plug-in hybrid. The ‘connected car’ technology will be introduced to a number of other Kia models in the near future. The ‘Imagine by Kia’ concept, revealed for the first time in Geneva, has been designed at the company’s European design centre in Frankfurt. A visual embodiment of its desire to move forward into the exciting world of electrification, this concept is Kia’s first pure electric four-door passenger car. Intentionally designed to not sit within the industry’s predefined vehicle categories, it coherently draws together elements of a muscular sports utility vehicle, a sleek and athletic family saloon and a versatile and spacious crossover. The ‘Imagine by Kia’ concept represents a more progressive Kia design language for the future, with intelligent reinterpretations of existing Kia motifs and a bodywork characterised by a blend of tautly-drawn sheet metal, crisp lines, and efficient aerodynamics. In its third generation, the all-new Kia Soul EV brings long-range, zero tailpipe emissions power to the urban crossover class, and becomes more distinctive, dynamic and innovative than ever. While the Soul EV embraces the iconic design and playful character of its predecessors, it will be powered in Europe exclusively by electric energy, with a choice of two long-range, zero-emissions powertrains. The Soul EV’s new-generation battery packs – either 64kWh or 39.2kWh in capacity – are up to 30 per cent more energy efficient than Europe’s current best-selling electric vehicle. An internal combustion engine option will not be available in Europe. Fresh, funky and distinctive, the new Soul EV features the same iconic, boxy silhouette, with newly-sculpted lines, sharper details, and more technical lighting elements. Inside, the cabin is more high-tech than ever, with its cool design and ultimate functionality accompanied by acoustic-inspired shapes and textures, and a new Sound Mood Lighting system. The Soul EV is offered with new colour customisation options, and a range of technologies which includes a wireless smartphone charger, heated and ventilated front seats, a Head-Up Display, and a premium harman/kardon sound system. At the heart of the Soul EV’s dashboard is Kia’s new 10.25-inch TFT LCD widescreen system, featuring Kia’s new UVO Connect telematics system. UVO Connect puts a raft of information at owners’ fingertips, including live traffic, weather, and parking availability. 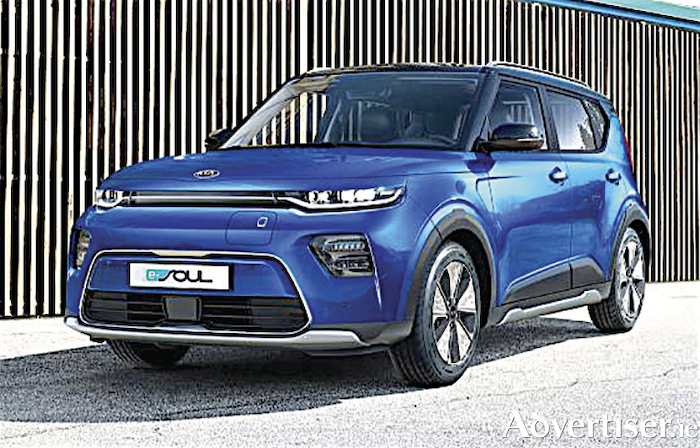 The Soul EV goes on-sale in select European markets from the end of the first quarter of 2019, sold as standard with Kia’s quality promise: an unrivalled seven-year, 100,000- mile warranty, which also covers the car’s electric motor and battery pack. The Irish on-sale date, specification and pricing for the Soul EV will be confirmed in due course. Making their global debut in Geneva, Kia has made a range of enhancements to the Niro hybrid and plug-in hybrid. Kia’s best-selling electrified crossover, which combines crossover style and practicality with ultra-low hybrid emissions, features a new exterior design, a more upscale, high-quality interior, and new interior colour customisation options. Furthermore, the Hybrid and plug-in hybrid models also now feature Kia’s advanced new UVO Connect telematics system, introducing additional ‘connected’ functionality. Since sales began in 2016, over 270,000 examples of the Niro have been sold globally, with more than 100,000 units sold in Europe. The Niro crossover was Kia’s fifth best-selling model in Europe in 2018, with sales growing 33 per cent to 45,255 units – including 34,642 hybrids and 9,951 plug-in hybrids. The Niro range expanded at the end of 2018 with the launch of the fully-electric e-Niro. European sales of the upgraded Kia Niro hybrid and Niro plug-in hybrid start during the second quarter of 2019. Uniquely among all hybrid cars in Europe, the Niro is sold with Kia’s industry-leading seven-year, 100,000-mile warranty as standard.